The Analytics view provides statistics and analysis tools. Annual developer salary – specify the average developer salary for your JRebel users (defaults to 40 000 USD). Select either USD or EUR as the desired currency. Number of developers – specify the total number of developers using JRebel at your company (defaults to the total number of JRebel licenses currently active in your account). Build and redeploy time (in minutes) – specify the average build and redeploy time for your average developer workstation, application and workspace (defaults to 2.7 minutes). 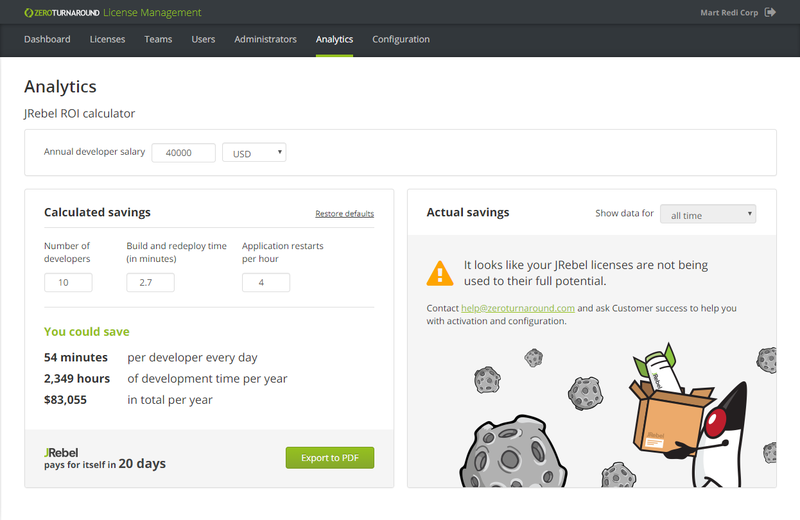 Application restarts per hour – specify how many application restarts your developers need to perform per hour (defaults to 4). Press Restore defaults to restore all values to the system defaults. Press Export to PDF to export the current calculation result as a PDF document. The Actual savings section details the overall time and money already saved by using JRebel. When enough data has been gathered, the Show data for drop-down menu can be used to narrow the time frame. 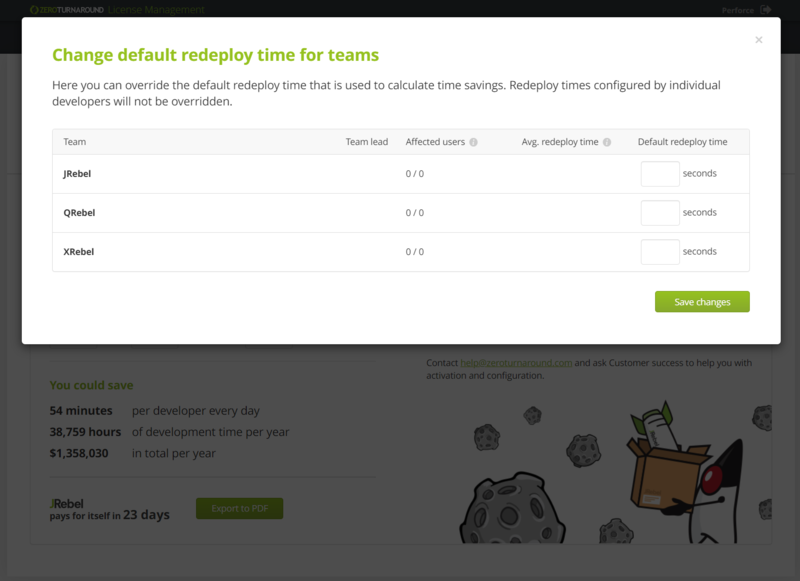 Pressing on the Configuration link in the Actual savings section will allow you to update the default redeploy time for each team. This will allow to see more accurate time savings. 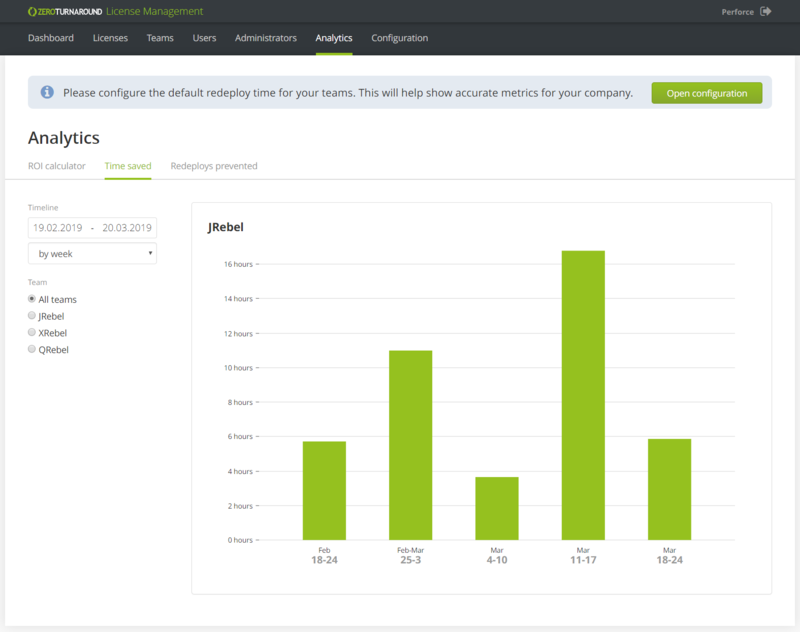 Learn more about Default redeploy time. Timeline – specify which period you would like to see. Granularity – specify whether you would like to see time savings per day, per week or per month. Granularity – specify whether you would like to see redeploys prevented per day, per week or per month.